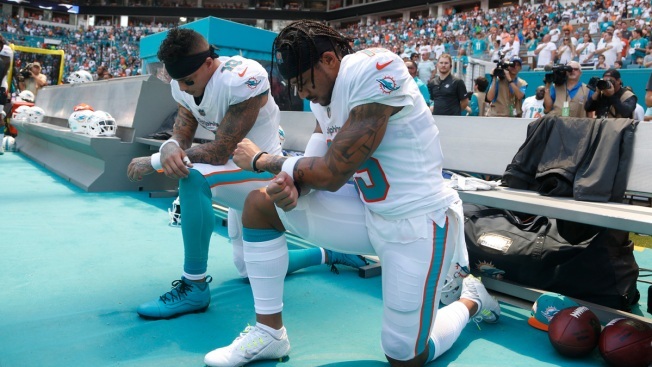 Last week, Nike introduced an ad featuring the Kaepernick and his message: "Believe in something, even if it means sacrificing everything"
Miami Dolphins wide receiver Kenny Stills (10) and Miami Dolphins wide receiver Albert Wilson (15) kneel during the national anthem before an NFL football game against the Tennessee Titans, Sunday, Sept. 9, 2018, in Miami Gardens, Fla.
Last season, the Seattle Seahawks led the league when it came to the number of players willing to make a statement while the national anthem played. In a league where more than 200 players once took some sort of action to protest police brutality and social injustice in America during the anthem, The Associated Press counted fewer than 10 across the league who did so on the NFL's opening Sunday. Only two of them — Albert Wilson and Kenny Stills of the Dolphins — kneeled while the "Star-Spangled Banner" played. 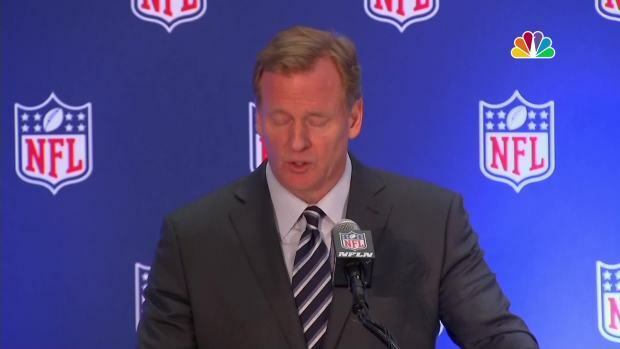 The NFL Commissioner stated "we believe everyone should stand for the national anthem" at a press conference Wednesday. None of which bothered Brown much. He says he's committed to what he's doing. "I made my decision," he said. "That was my decision. I wasn't paying attention to what other teams or other players are doing." The lower numbers might reflect a new strategy many players are embracing to draw attention to the issues Colin Kaepernick raised when he began kneeling for the anthem in 2016. The then-San Francisco 49ers quarterback was looking to shine a light on issues impacting African American communities. Since then, a group of NFL players have formed the Players Coalition. 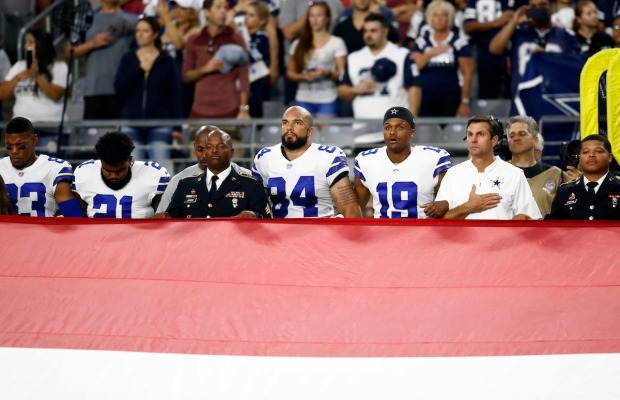 They want to move the focus away from the anthem, which has become a lightning rod, in part because of President Donald Trump's continued criticism of players who don't stand during the anthem. "We're trying to move past the rhetoric of what's right or what's wrong in terms of the anthem, and really focus on the systematic issues that are plaguing our communities," said Malcolm Jenkins of the Eagles, one of the group's co-founders, who is no longer protesting during the anthem. And yet, if Kaepernick is on board with all of that, it wasn't clear Sunday. He took to twitter to praise Wilson and Stiles . "My Brothers (Stills) and (Wilson) continue to show their unwavering strength by fighting for the oppressed," Kaepernick said in his tweet. "They have not backed down, even when attacked and intimidated. ... Love is at the root of our resistance." Kaepernick's message got through to his friends in Miami. "I know he has our back," Stills said. "Really, there has been a huge difference between when we first started protesting and now. A lot of people are reaching out and supporting us, so I really appreciate that. To everybody out there ... let's keep doing our best to make positive change and have these conversations and make our country a better place." Since opting out of his contract after 2016, Kaepernick has been unable to land a job with an NFL team and is suing the league for collusion. But his voice is still being heard. Last week, Nike introduced an ad featuring the quarterback and his message: "Believe in something, even if it means sacrificing everything." Other than Stills, Wilson and the two Seahawks, Dolphins defensive lineman Robert Quinn raised his fist during the anthem. Niners receiver Marquise Goodwin did the same at San Francisco's game at Minnesota. In Los Angeles, Chargers left tackle Russell Okung raised his fist. And back in Denver, Broncos receiver Demaryius Thomas and linebacker Brandon Marshall retreated to their tunnel while the anthem played. A Lake Ozark, Missouri, bar is under scrutiny for doormats that some see as a racist gesture. Owner Jason Burle said race was not the issue on his mind when he taped two NFL jerseys in front of the S.N.A.F.U. bar that read "Lynch" and "Kaepernick." Marshall sent out a statement touting a charity designed to help people who are on the verge of homelessness. "It is time that we build social currency by way of empowering our future generations," Marshall said. "This begins by addressing the most fundamental needs — by feeding the minds and bodies." This came hours after Trump opened the day with a tweet that took digs at the NFL, linking low ratings for Thursday night's opener between Atlanta and Philadelphia (lowest for an opener since 2008) to players who refuse to stand for the anthem. "If the players stood proudly for our Flag and Anthem, and it is all shown on broadcast, maybe ratings could come back? Otherwise worse!" he tweeted. CBS and Fox, which carried Sunday afternoon's games, did not televise the anthem. However, NBC did show the anthem Thursday night (but not before Sunday night's Bears-Packers game), and no players kneeled or protested in other ways. 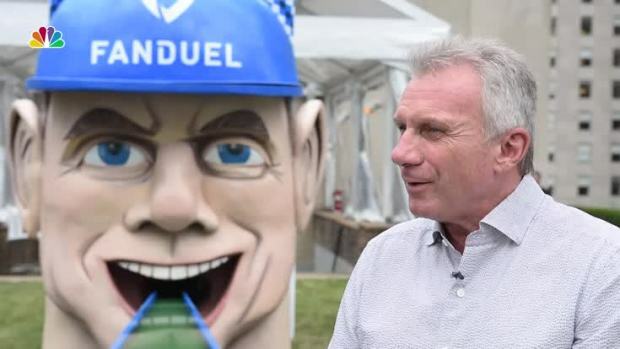 Storied football Hall of Famer Joe Montana tells NBC's Eric Hinton that Colin Kaepernick is most likely out of the NFL because of poor play, not his controversial stance of kneeling before the National Anthem last season. But while the tumult over the anthem appears to be dying down, the NFL still hasn't collaborated with the players union to come up with a definitive solution. In May, the league briefly put a policy in place, but rescinded it after the union filed a grievance. The union and league are still negotiating. Brown, of the Seahawks, said he has not received any message from the union to tamp down the protest. "I don't think that would be the best idea to try to get people to move on from it," he said. "The country hasn't moved on from it, so I'm not going to move on from it either."